For this past week, I've been seeing these guys every morning standing on the roof of their truck wearing blue colored clown hair, and waving signs to passing cars. 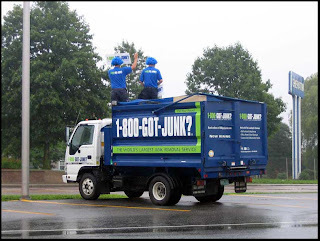 Basically, it's free advertising for their business called "1-800-GOT-JUNK?" They park their truck in the Staples Plaza parking lot facing Main Street, and they seem to attract a lot of attention from passing motorist travelling on Williston Rd and Main St, and also from those getting off I-89 via Exit 14. It looks like their creative idea seems to be working. Good for them! I have seen those trucks on my to work from Annie's day care. No Clowns though, just a dozen hairless cats... Very strange.